Absinthe Gothicsinth is just weaker (estimated around 5%) than our other new creation and therefore probably the second strongest legal absinthe available all over the world. Here, be careful! Gothicsinth absinthe is first of all a pure distillate. But as a pure distillate can not have the very strong absinthe effect (by distillation, the essential active ingredients are not enough to go over into the final result), added yet other important ingredients, that increase the absinthe effect significantly. Overall, in this absinthe are used 6 different herbs in different ways. For about 11 months, we worked out to this effect and we have tested and tested ... We are already gone with alcohol and thujone basically to the allowed maximum, but so long as our customers know that thujone alone does not significantly so. The interaction of alcohol and thujone with other herbs and spices has to fit just comes out the other end of an absinthe as anyone else and is not intended been our own objective of this special absinthe. Basically, our philosophy, along with the Cami Distillery yes good taste with the highest possible absinthe effect is to combine. This absinthe should have at first the highest absinthe effect. The taste is complex with a rounded flavor. Although the anise (not star anise, but milder green anise) was kept very low and the herb flavor predominates here clearly occurs on addition of cold water, an intense black-red opacity / Louche effect. Absinthe Gothicsinth is especially for the gothic scene dyed black. All lovers of the black cult should have found Gothicsinth what they were looking for. Not just a black absinthe, but also a strength that emanates from this mystical beverage. 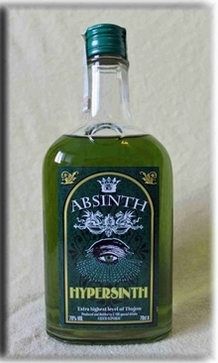 Absinthe Gothicsinth comes in a dark glass bottle with cork, which almost 90% vol. alc. also withstand. In this first batch 170 bottles were produced.